Tucked into the foothills of the Blue Ridge Mountains, Marion boasts a bustling downtown district with art, local theaters, restaurants, independent shops, antique stores, and breweries. 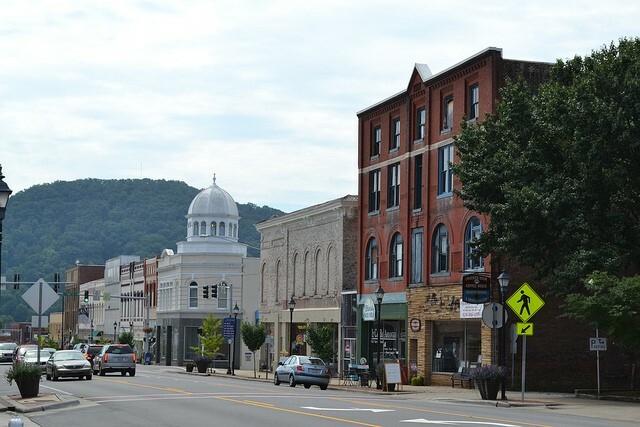 Listed on the National Register of Historic Places and awarded the Small Town of the Year (2018), McDowell’s county seat has a rich history and bright future. The town hosts several festivals including arts and crafts, holiday celebrations, and our unique Bigfoot, Donut, and Livermush festivals to name a few. Marion also has a vibrant tailgate market that operates year-round, live concerts during the summer months, and several parks and greenways. With a population of about 7,600, Marion is home to the McDowell Economic Development Association (MEDA), which recruits and assists industries in partnership with the North Carolina Department of Commerce. The Marion Business Association works with MEDA and the Chamber to meet the needs of downtown businesses. The city’s open-door policy, proximity to Interstate 40 and both Asheville and Charlotte airports along with modest business tax rates are among Marion’s business-friendly attributes. As a Main Street city, Marion participates in the national program that works to generate economic development through assistance to small businesses with business plans, an entrepreneurship class and other initiatives. Old Fort is considered the gateway to the mountains and has the perfect mix of quaint mountain shops and ample recreational opportunities. Its bright yellow train depot welcomes visitors into town and honors the rich railroad history and one can’t miss the towering granite arrowhead paying homage to its Native American heritage. 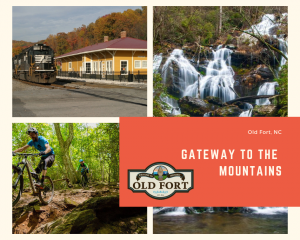 Old Fort also boasts thousands of acres of the Pisgah National Forest and hosts several outdoor sporting events such as the Assault on Mount Mitchell mountain bike challenge and Downhill at Dawn half marathon. The Mountain Gateway Museum downtown, which chronicles some of the early activity in the area, depicts the late 1700s up to the 1900s. The free museum, now a branch of the North Carolina Museum of History, contains exhibits on farming, clothing and music. Two 19th-century cabins in the county were moved to the museum’s grounds and are furnished with a loom, spinning wheel and other artifacts. The museum hosts an annual Pioneer Day in April that features crafts, blacksmithing, spinning and weaving demonstrations and re-enactors from the Revolutionary War and Civil War eras. Blue Ridge Traditions in Old Fort is a free summertime concert series with traditional mountain music, ballads and bluegrass and craft workshops. Old Fort Oktoberfest includes music and crafts. 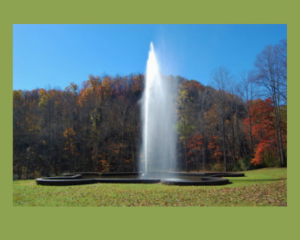 Another attraction just outside town is Andrews’ Geyser, a gravity-fed geyser developed in 1879 to entertain rail passengers and visitors to the Round Knob Hotel. A different form of entertainment in town is the National Championship Rodeo around July Fourth each year. When it’s time to switch from play to work, Old Fort has several businesses that keep the economy humming. They include companies that serve the automobile industry, a furniture plant and textile mills. Nebo is an unincorporated community just east of Marion and features rural neighborhoods, several independent businesses, and its gem, Lake James. Envision a mountain reservoir dotted with islands and quiet coves surrounded by a national forest and wilderness and you can imagine some of the charm of Lake James. 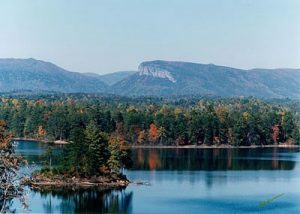 Fed by the Catawba River, the lake expands the recreational opportunities to the area offering hiking, mountain biking, fishing, swimming, running, boating, paddle boarding, kayaking, rock climbing (in the nearby Linville Gorge Wilderness Area) and more. The 6,500-acre lake and four earthen dams were created between 1916 and 1923 as a hydro-electric project by Duke Power Company (now Duke Energy Corporation) to supply electricity to homes and businesses and is the centerpiece of Lake James State Park. 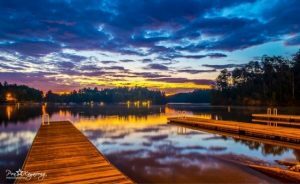 Named for one of the company’s founders and benefactor of Duke University, James B. Duke the lake boasts 150 miles of forested shoreline and stretches into Burke county to the east. Visitors to this enchanting natural treasure can catch awe-inspiring views of Linville Gorge, called the Grand Canyon of the east. 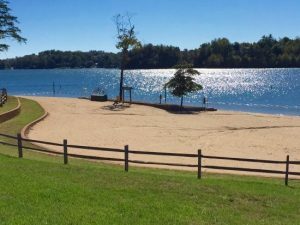 Lake James State Park, developed in the 1980s, covers 3,644 acres, is open year-round, and welcomes around 400,000 visitors a year. The park offers camping, nature programs, beach areas, skiing, boating, canoe and other beach rentals. There are picnic areas with grills, trails, outdoor showers for rinsing off the sand and dirt too. Fisherman enjoy catching largemouth bass, crappie, bluegill, catfish and record-setting muskellunge. The trails are lined with azaleas, rhododendrons and dogwoods, and you may spy some creatures who call the lake home—mink, flying squirrels, red and gray foxes and muskrats. Surrounding the lake are several residential communities with year-round and vacation homes and vacation rentals. 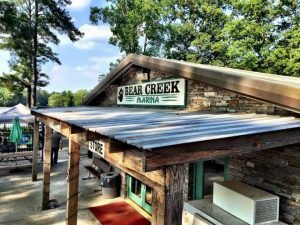 Bear Creek Marina on the McDowell side has a restaurant and bar open seasonally with live music on weekends. Nearby, the South Creek Vineyards & Winery has tastings and tours and Marion Lake Club Golf Course is close by as well. Nebo/Lake James is home to a portion of the National Park Service’s Overmountain Victory National Historic Trail, which commemorates Revolutionary War history. Fun Fact: Parts of The Hunt for Red October and The Last of the Mohicans were filmed at the lake. This community along the Blue Ridge Parkway in northern McDowell County earned its name for a reason. With an elevation range from 3,200 feet in town to 4,000 feet at the top of Grassy Mountain nearby, magnificent year-round views draw visitors starting in the spring. This is mountain country, and renowned peaks nearby are visible, among them Mount Mitchell, the highest point east of the Mississippi River to the west and beloved Grandfather Mountain to the east. Little Switzerland, formed in 1909 by a group of Charlotte businessmen, is a small community but offers a pleasant mix of activities. 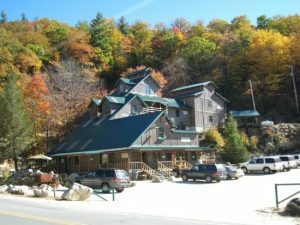 Though some people are permanent residents of the village, Little Switzerland was created as a vacation site and most businesses are open generally spring through fall to accommodate tourists. The village is in both McDowell and Mitchell counties. The Switzerland Inn even has rooms in both localities. In addition to the century-old inn, Big Lynn Lodge has hosted families since 1932. Other accommodations include mountaintop cabins and villas, some from the turn of the century, which boast dazzling scenery. Little Switzerland is a music town, and visitors enjoy summertime square dancing at the community hall and live mountain music every weekend. One venue for music—and much more—is The Historic Orchard at Altapass, just outside Little Switzerland on the Blue Ridge Parkway. The century-old orchard, a nonprofit, is a hub of mountain culture with cloggers, regional artists, storytelling, hayrides and, of course, apples. 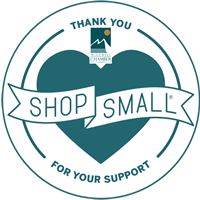 You’ll find more Appalachian culture in Little Switzerland’s including a gift shop with locally made jewelry, pottery, a bookstore, gems, blown glass, and other fine works from nationally-renowned craftsmen in the region. Browsers of Little Switzerland’s unique shops will also be enticed by ice-cream and homemade chocolate. Many visitors consider Emerald Village, just outside Little Switzerland on the Blue Ridge Parkway, a jewel. 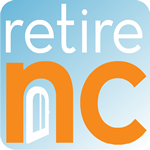 The attraction includes underground mine tours and gem mining, and the Museum of North Carolina Minerals is off the parkway nearby. A treat for outdoor enthusiasts is a short hike near the center of town to Grassy Creek Falls, a 30-foot waterfall beside an old quarry. The area is also known for driving and motorcycle tours along the Parkway and area winding roads.